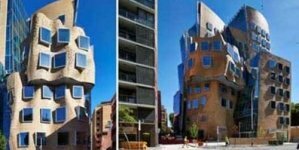 Moore Ruble Yudell Architects & Planners’ garage in Santa Monica, California, is easy to spot with its concrete-and-colored-channel-glass façade that appears as opaque planes of color by day and illuminated fluorescence by night. 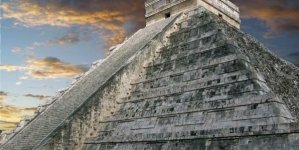 Whether tinted in a pretty pastel or saturated in juicy brights, these polychromatic buildings add a dash of color to their surroundings. 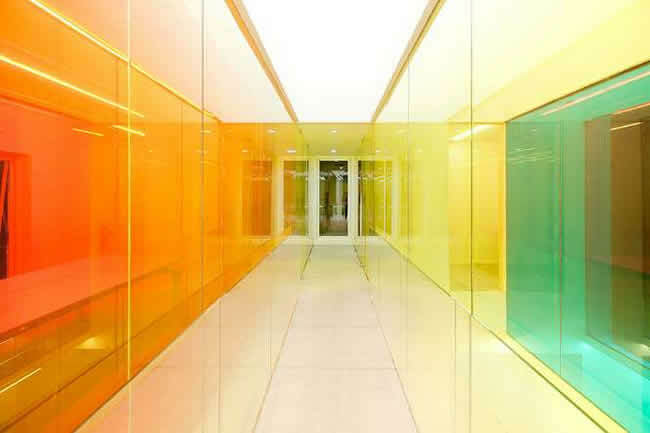 Inside the headquarters of 21 Cake a gourmet cake company in Beijing the design firm People’s Architecture Office erected walls of laminated glass in red, yellow, and blue. 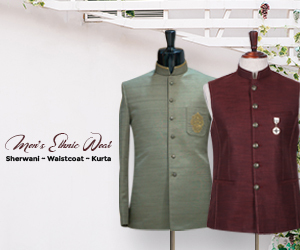 As natural light from the skylight floods the space, the primary colors intersect to create a spectrum of shades, like a layer cake. 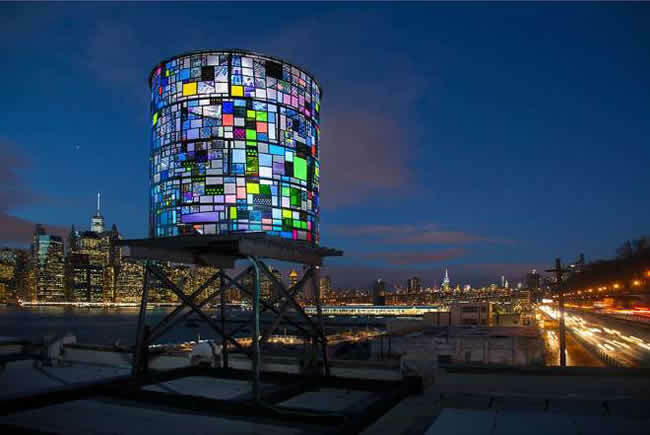 Made from found Plexiglas, artist Tom Fruin’s Watertower is perched on a rooftop near New York’s Brooklyn Bridge Park, where it adds a burst of color to the urban landscape. 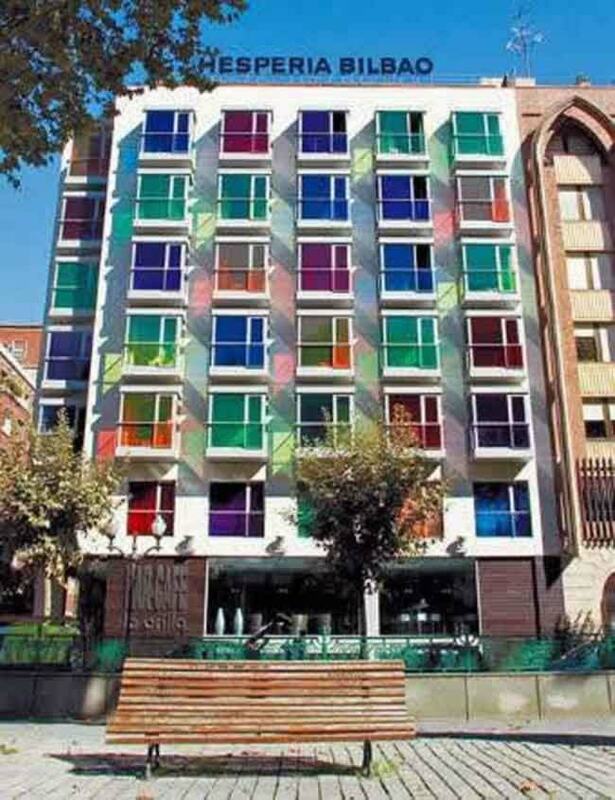 Architect Iñaki Aurrekoetxea Aurre’s Hotel Hesperia Bilbao in Spain beckons weary travelers with its Jolly Rancher–hued crystal windows. For his Cathedral of Brasília, completed in 1970, architect Oscar Niemeyer constructed a striking hyperboloid structure from 16 concrete columns. 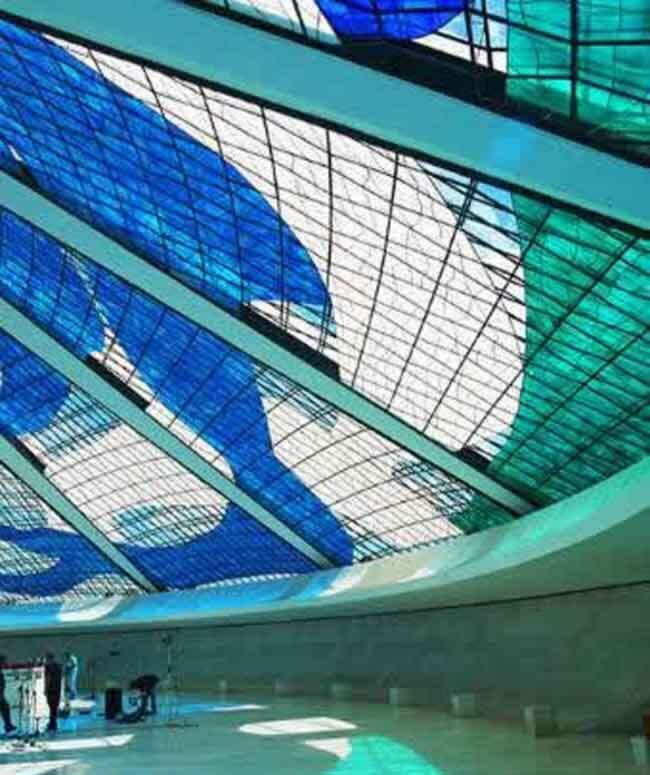 Years later, a 21,528-square-foot stained-glass work by Marianne Peretti replaced the clear glass that filled the negative space between the pillars, creating a swirling pattern of blues and greens visible from both inside and out. 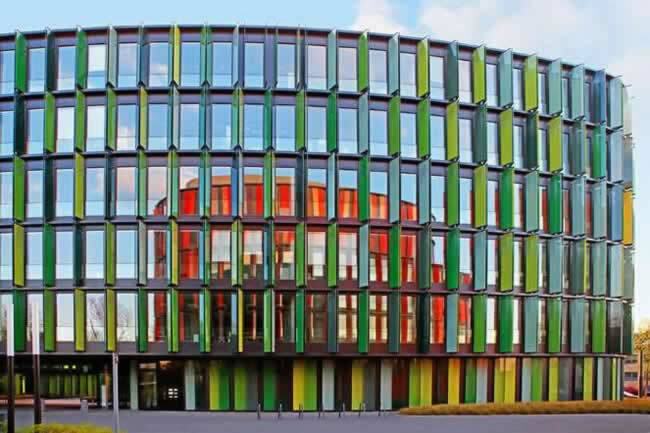 The Cologne Oval Offices in Germany, an office complex completed in 2010 by architecture firm Sauerbruch Hutton, owes its brilliant façade to 5,000 vibrantly colored louvers. 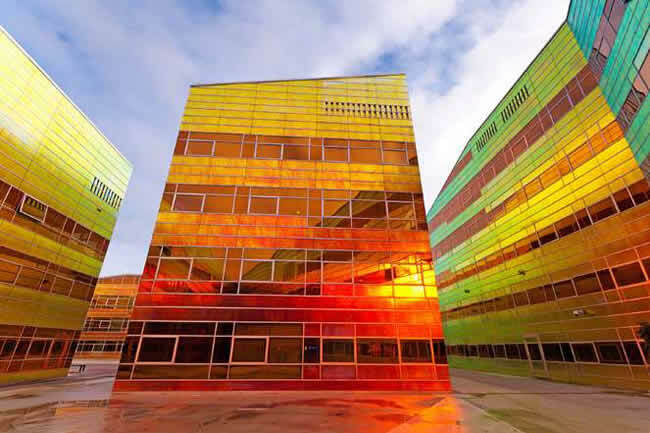 Each laminated glass pane is screen-printed with color that is then perforated with transparent dots, allowing the surface to appear opaque or transparent, depending on the passing light. 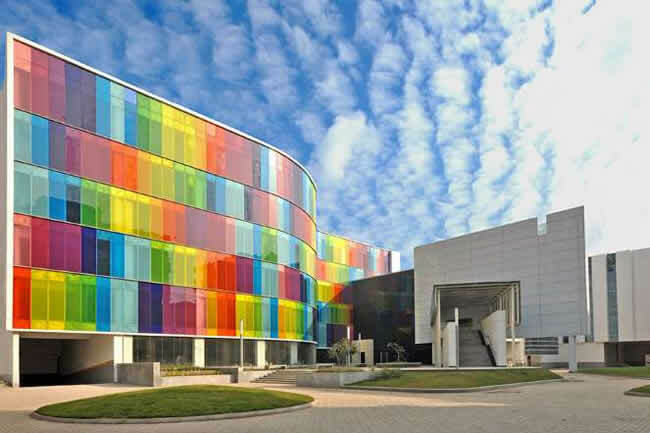 For the business school facilities at the International Management Institute in Kolkata, India, Abin Design Studio sandwiched a colored resin called PVB between panes of glass to create the building’s undulating, rainbow-hued exterior. 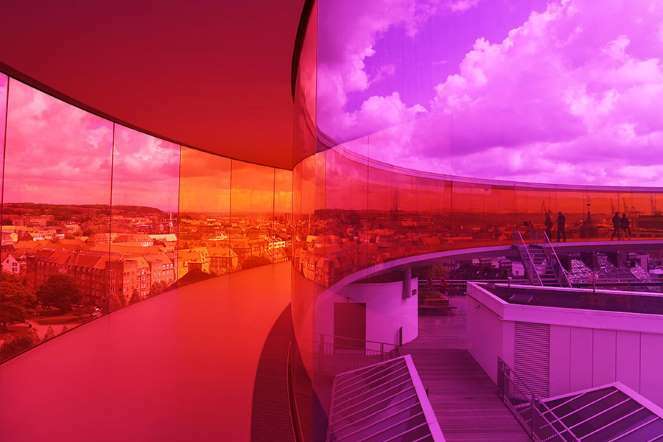 Famous for playing with perception, artist and designer Olafur Eliasson created the Rainbow Panorama, which resembles a color wheel hovering over Aarhus, Denmark. 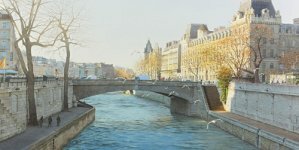 As visitors stroll through the elevated gradient, their view of the city is colored in rich candy hues. 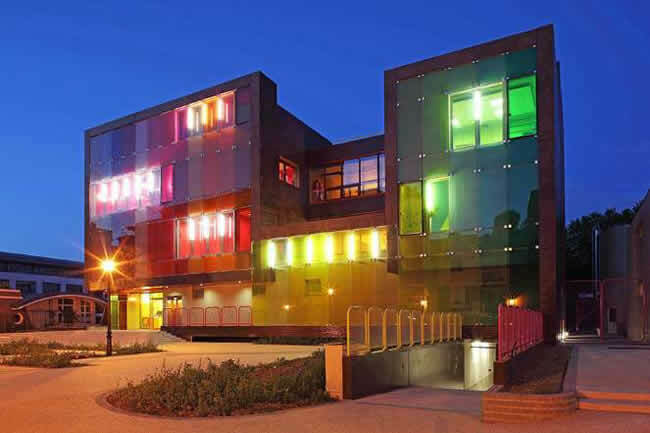 Koz Architectes’ Le Ruban Youth Center and Sports Complex in Saint-Cloud, France, screams “playtime.” Its Cubist concrete casing is clad in a tinted-glass color scheme that ranges from red to green. 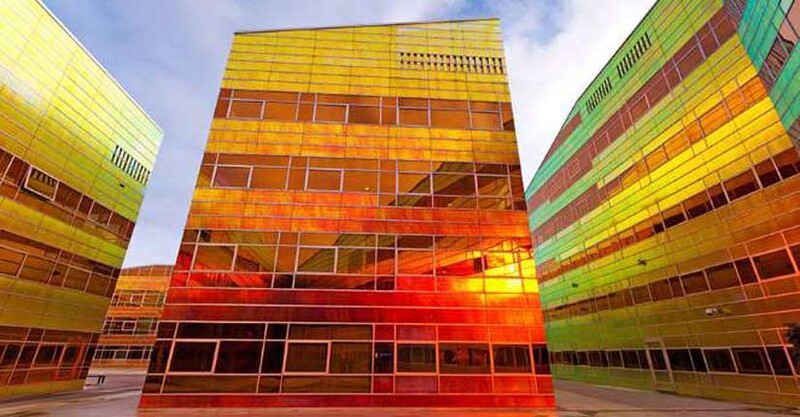 UNStudio’s La Defense office complex in Almere, Netherlands, is clad in glass panels covered in multicolor foil, allowing the exterior to reflect a brilliant range of colors depending on the light and time of day.